Thank you to Hot Key Books for sending me this book via Netgalley in exchange for an honest review. I'm gonna be honest - the only reason I was drawn to Bookshop Girl was because of the title. A YA read about a bookshop? Erm yes please. And the more I looked into this book the more I knew I wanted to read it. So here we are. Bennett's Bookshop means a lot to sixteen year old Paige Turner. It's a place where she can escape from her dull hometown, hang out with her best friend and fellow bookworm, Holly and also earn money. However, like many bookshops Bennett's has started to become a casualty of the high street and is going to be torn down. Paige is serious about to trying to save it but getting the people of her town, Greysworth to cooperate is no mean feat. That isn't the only problem Paige has to deal with. How is she going to fend off beautiful fellow artist Blaine? and will his anarchist ways make or break her strong campaign? This was a short, sweet all about town spirit and fighting for what you believe in..and I loved that. The way everyone rallied around to save the bookshop was so heartwarming and brought a big smile to face. As someone who lives in a town where bookshops are on the decline (there's only 2 major bookshop chains and no independent bookshops in the town centre) it really did resonate with me on a personal level. Bookshops are amazing and need to stay as a staple shop on our high streets! Despite being quite a short read Bookshop Girl had tonnes of personality and kept me engaged until the very end. It is so relevant to present day (as stated) where bookshops and libraries are closing and online book shopping is becoming more and more popular. It does make you realise that bookshops are still important. I also enjoyed the aspect of feminism that is mentioned throughout the book - something else that is so relevant to what has been in the news recently. Each and every character in Bookshop Girl was so full of life and personality and I couldn't find one disliked, well apart from one. Paige was such a smart, bubbly character and I loved her determination and fight. She was quite comedic and reminded me of what I was like when I was a teenager. Laughter did come out a few times over a few things that happened to her. Her unbreakable friendship with Holly was also a joy to read - yes they had a few bickers but in the end they came back together and that is what true friendship is all about. If I had to say something negative about Bookshop Girl it would be that some of the language used by Paige and Holly wasn't believable. When reading these bits I wasn't convinced that teenagers today would say things like that. That may just be me getting old though. 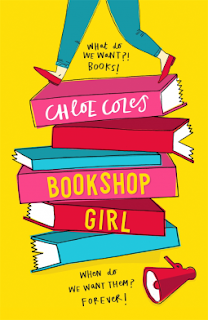 Bookshop Girl was a really enjoyable read that had me smiling, laughing and reminiscing. I cannot wait to read the next book featuring Paige and her adventures. Originally from Northampton, Chloe studied Illustration at Cambridge School of Art, before moving to London. 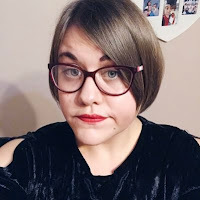 She has worked in bookselling since the age of sixteen, and now works as a Children’s Specialist and Assistant Buyer at Foyles Charing Cross. As well as a writer and bookseller, Chloe is also an artist and sings in a band with her best friend.